Contrary to what many believe, LED lights do come in multiple light temperatures and colors! The technology behind LEDs has advanced drastically since they were first introduced to us in the form of long-lasting, eco-friendly lightbulbs for household lamps and light fixtures. Today, LED lights come in many shapes, sizes, and - yes - even colors! 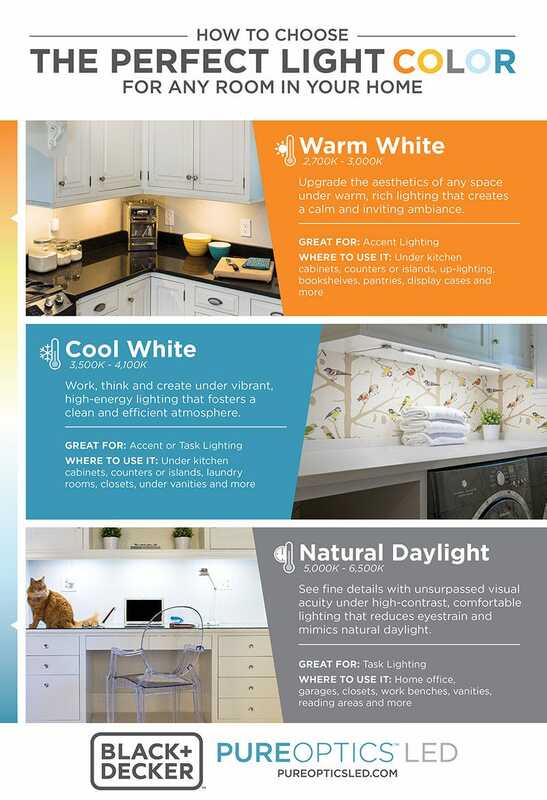 Read on to learn more about the various color temperatures LED lights - including under cabinet lighting - are available in and what application fits them best! Upgrade the aesthetics of any space under warm, rick lighting that creates a calm and inviting ambiance. Where to use it: Under kitchen cabinets, counters or islands, up-lighting, bookshelves, pantries, display cases and more. Work, think and create under vibrant high-energy lighting that fosters a clean and efficient atmosphere. Where to use it: Under kitchen cabinets, counters or islands, counters or islands, laundry rooms, closets, under vanities and more. See fine details with unsurpassed visual acuity under high-contrast, comfortable lighting that reduces eyestrain and mimics natural daylight.